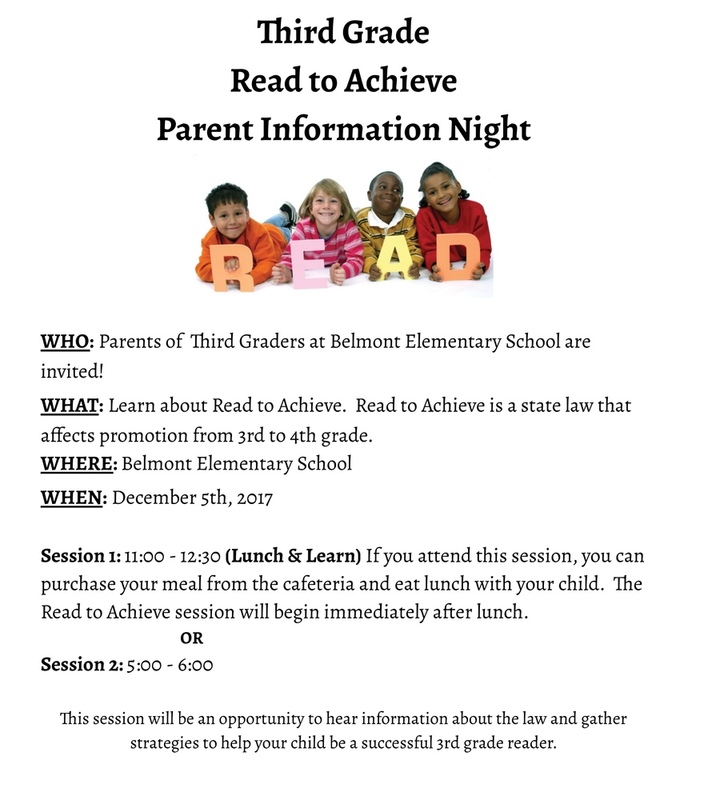 On December 5th, Belmont Elementary School will hold 2 sessions of our Read To Achieve Parent Information Event for the parents of our 3rd grade classes. Read to Achieve is a state law that affects promotion for students from 3rd to 4th grade. These sessions will provide opportunities to hear information about the law and gather strategies to help your child become a successful 3rd grade reader. Session 1 will be a Lunch and Learn from 11-12:30 and will be held in the cafeteria at Belmont. If you attend this session, you can purchase your meal from the cafeteria and eat lunch with your child. The Read to Achieve session will begin immediately after lunch. Session 2 will be held at Belmont from 5-6pm. We look forward to seeing a great turnout from our fantastic 3rd grade parents! !